I absolutely adore everything about fall. From the colors to the weather it's just so calming. Some of my favorite things start to come out around this time too and I decided to share those with you today. Don't worry only one of them is pumpkin related. One. Plaid // Scarves, pants, shirts... you name it and I am all for it. This style can be dressed up or dressed down and there's really no wrong way to wear it. Two. Candy Corn // I know not everyone agrees with me on this one, but I love candy corn! Especially the M&M's candy corn flavor- yum! Three. Candles // I love having candles all year round, but the fall collections are incredible. The Marshmallow Fireside is my absolute favvvvveeee! Four. Burgundy // This color is everything! It's the perfect fall color, because it's so deep and rich it looks good on anyone and on anything. Nail polish, sweaters, lipstick, shoes, blankets, eyeshadow and so much more. I mean the possibilites are endless. Give me all things burgundy please! Five. 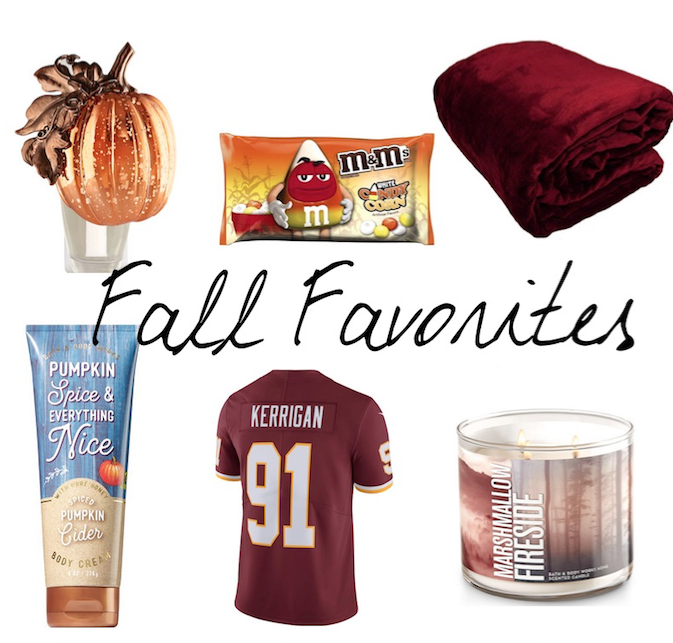 Pumpkin Spiced Lotion // My all time favorite lotion is the pumpkin spice one from Bath & Body Works. It's like fall in a tube. Seriously though, it's the best and I always stock up on this when the season rolls around. See, I promised you it was only one pumpkin thing! Six. Football // Come on, who doesn't love football season? HAIL TO THE REDSKINS!